We can help create an environment in your greenhouse suitable for the plants that you may want to grow, or are growing. We specialize in tropical plant and orchid growing environments. The selection of climate control equipment for heating, cooling, air circulation, lighting, humidity, shading, and irrigation is tailored to your growing conditions. Computer controlled operation may be incorporated. We work with your architect, landscape architect, and contractor on new projects to design a fully functional greenhouse that works! We have done many Amdega Conservatory and Texas Greenhouse projects. We are a representative for Microgrow Greenhouse Control Systems. You have a great investment in a greenhouse, as well as beautiful plants that give you pleasure. 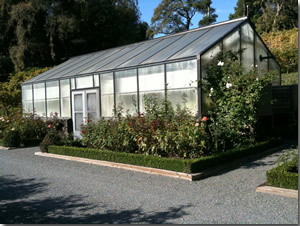 We can manage and maintain your existing greenhouse. Weekly, monthly and quarterly visits can include plant maintenence, watering, fertilizing, repotting and pest control. We can keep your greenhouse equipment in good order and can also install monitoring equipment with remote access. If you are new to a greenhouse, we can offer training on plant care and repotting.